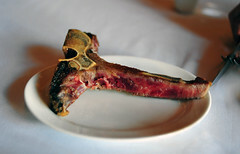 Reports of an eight-month dry-aged steak seemed like a figment. I had to check it out. 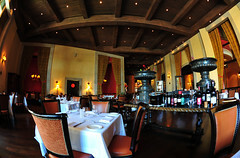 I had called two weeks in advance and asked for one of their oldest “riserva” steaks to be prepared for my guest and me. We were wanting the lightest possible lunch (much eating was done before and after) so, between the 12 oz. strip steak ($75) and the much larger Porterhouse ($100 per inch), I selected the strip steak. I can’t tell you how that eight-month dry-aged steak tastes because I didn’t end up having an eight-month dry-aged steak. I had one that was dry-aged for eleven months. Of course, I had no way of verifying the veracity of this claim, which was enthusiastically made by our server at Carnevino when we arrived in late July (2009). 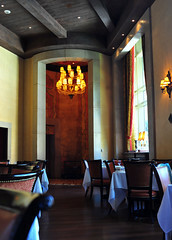 He said that our steak had been butchered and began the dry aging process early September of 2008. How could this be possible? How is this done? I had so many questions. I wanted to see this off-site dry-aging facility (overseen by none other than Adam Perry Lang) for myself. Despite the manager’s willingness to inquire about arranging a tour of the aging facilities, he never called me back. When I followed up with them the day before our meal (as I happen to be walking by the restaurant), the manager apologized and said that it would not be possible. So, it was on this rather dubious note that I was hoodwinked into a Porterhouse. That’s right, when we arrived – the manager that I had spoken with being off duty that day – no riserva strip steak had been prepared for us as promised. 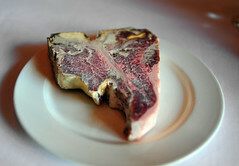 Instead, the only thing they had brought from the meat locker was a riserva Porterhouse. Despite my firm protest, our server insisted that there is, in actuality, no way of guaranteeing that one or another cut would be available and that a promise should never have been made as to which cut I would get (actually, he didn’t even say that much, he simply said the Porterhouse was all they had). Letting my curiosity overcome my pride, I relented, begrudgingly (it really is a matter of principle for me). I asked for a one-inch cut. When it arrived for our inspection, the steak was cold. Weighing in at 20 ounces, whatever molded fat rind that had protected the meat had been cut away, leaving the meat nicely trimmed with just a thin fat edging. 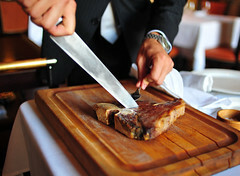 The server said that they had gently dusted the meat off, as the saw had left a film of bone dust as it cut through. The server added that the bone had even begun to break down, a claim that I found somewhat hard to believe. I asked to smell the meat. It didn’t have a strong odor, but it did have a slightly mustiness about it. I asked how it would be cooked. A steak aged this long cannot be broiled at the same high temperature as less mature steaks (our server said that their broilers fire up to temperatures in excess of 1200F). Instead, riserva steaks are placed in a side space with the broilers turned off, drawing ambient heat from the neighboring broilers for cooking heat. I surmised that there would be no crust on this steak, and the server confirmed that this cooking method prevented a crust from forming. The steak would be prepared medium rare. I asked what kind of beef it was and where it came from. 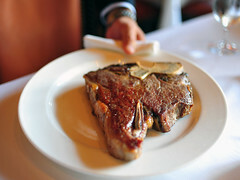 According to the server the Porterhouse is CAB (Certified Angus Beef) – which means very little. No other provenance was offered. He said that it was grass-fed for about 12 months and finished on grain for the last 8 to 10 months. That seemed like an extraordinarily generous amount of grain feeding. It was very well marbled. I asked about shrinkage. We were told that the steak had lost about 1/3 of its weight in the dry-aging process. I balked. That seemed very little shrinkage for the considerable amount of time it had been aged. But the server claimed that it was well-protected by a thick layer of fat, which prevented too much moisture from escaping. Not terribly satisfied by the answers, but having sufficiently exhausted our poor server’s knowledge, I locked away my curiosity for later investigation. Whilst the steak was being brought to room temperature and readied for cooking, my friend and I each ordered a salad. 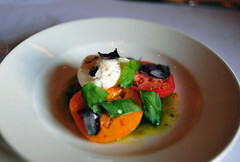 Juicy and ripe, the multi-colored, heirloom tomatoes in Cowboy’s “Insalata Caprese DOC” ($17) were blanketed with fresh basil and nestled with a fist of fresh “mozzarella from Campania.” Does the fact that the mozzarella di bufula is D.O.C. (Denominazione di Origine Controllata) make the whole salad D.O.C.? I don’t know, but it did make this salad expensive. And it did make this salad better than it otherwise might have been – the mozzarella was buttery with a full, milky roundness. My towering “Arugula Salad” ($14) was interwoven with ribbons of tissue-thin shavings of king oyster mushrooms and silky strands of pickled onion. Dressed simply with some lemon juice, olive oil, and salt, it’s the kind of salad that makes you march through it. 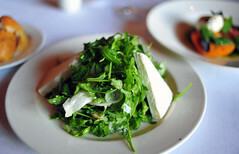 Leaning against the heap of greens were two generous wedges of Coach Farm goat cheese. The steak arrived. There was barely any crust – just a little blush along the sirloin where the Maillard reaction had clearly initiated. 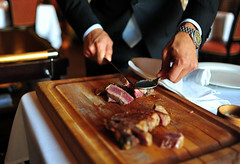 A carving station was brought and the steak was quickly cut and the pieces split between two plates. The meat met little treatment save a drizzle of olive oil and a dash of Maldon salt. The meat nearest to the bone being the tastiest, and the hardest to harvest, the T-bone was given its own plate and was left for us to enjoy. I asked for a side of vegetables. Our serve said they had a carrot dish that was unique. Indeed, it was. The “Saffron-Braised Baby Carrots and Romano Beans” ($9) was a rustic, stewed vegetable dish with baby carrots and bright green Romano beans (first identified by our server as “sugar snaps” before I asked for a clarification). I’m not sure where the saffron was, but the stew sauce was flavorful, the carrots were sweet, and the beans were softened and very fresh. Perhaps better suited for a winter steak meal, it was, nonetheless, a truly great dish of vegetables. 1. The texture was very waxy. To me, this was the best thing about the steak, the one trait that made me return to it, bite after bite. It wasn’t as waxy as attic-hung ham, per se. But the fat in this meat had clearly achieved a different state of being – as if it had been melted and then redistributed such that every single fiber and strand of meat had been coated with fat (as opposed to alternating pockets of fat and meat). It’s almost as if what liquid was left in the muscle fiber was sealed in from a fair layer of wax. 2. The beef was unexpectedly (shockingly?) mild-tasting. 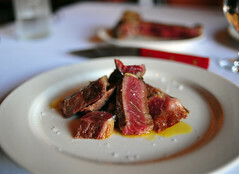 With all the heavy-hitting descriptors bantered about (and which I have experienced) with regard to dry-aged beef (e.g. foie gras and Gorgonzola), I was expecting a much richer, deeper, more complex savory/meaty flavor. This riserva steak was shockingly mild. I’ve had lesser-aged steaks with more intense flavor. 3. There was a strong rosemary scent. When I commented on that, the server confirmed that they had rubbed the steak with rosemary, garlic, and a little butter before cooking. If there is a next time, I will ask them to refrain from treating the meat with rosemary (or any other herb). Perhaps they did it to mask the funk. Perhaps it was the Italian touch. Whatever the reason, I’m not sure that it served its purpose well. It muddied the flavor. Something about the way the rosemary interacted with the mild funk of the meat gave it more of a woody rosemary flavor. I really enjoy the fragrance of rosemary, but I’m not sure I liked it here. In fact, I’d say it was a bit distracting. 4. The beef was very sweet. I’ve never had beef this sweet before. I have no reason to disbelieve that this meat was 11-months old. The texture really was totally different from any other aged beef I’ve ever had. Whether or not it was actually 11-months, or less, all I know is that it must have been aged far beyond 60 days (heretofore, the longest aged beef I’ve ever had). If this beef was truly 11-months old, I’m a little shocked by the price. 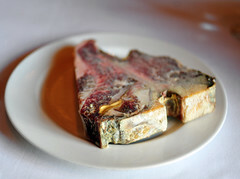 I mean, $100 for a Porterhouse isn’t cheap, but given that it’s extremely aged, it’s not expensive either. But then again, if it’s not going to be consumed and will be going to waste, I suppose getting some money for it is better than getting no money for it. It’s not like they were batting away customers; we were the only table at lunch. Assuming that the meat is truly dry-aged for 11-months, I felt the need to do a little more research. I turned to some experts. They were just as befuddled as I was. Eleven months seemed shockingly long to them too. How did the meat not mold over entirely? How did it not go completely rancid? How was the shrinkage limited to 1/3 of the total weight? How were the USDA meat inspectors not troubled? As to how the shrinkage was limited, one of my friends, who is a specialty meat purveyor, speculated that rendered tallow had been applied to seal the surfaces of the aging meat where flesh would normally be exposed. He’s seen this technique done in other instances. Yet, even that, my friend said, would be an iffy technique: the surface of the meat would have to be extremely clean, otherwise, bacteria trapped between the tallow and the surface of the meat would cause problems. As my steak came fully trimmed, whether rendered fat had been cosmetically applied as a sealant was not something I could determine. As to how the meat had not spoiled, another friend (after discussing the matter with others in the industry) offered this explanation: could the meat have undergone UV radiation treatment? It’s often used in the food industry to help stave off infectious growth. Though it might prevent the meat from over-molding, it would most likely kill off some of its flavor as well, much like the way pasteurization destroys the natural flavors in raw milk. This seemed like a plausible explanation. It would explain the steak’s surprisingly shallow flavor. This would also explain why there’s no price difference between an eight-month and eleven-month dry-aged steak. If their technique preserves meat so well, then all of their steaks could be stretched to that length with little effort. For me, the mystery’s not solved. I’d like to know more. And so would many whom I know. Was this steak worth the price of admission? Perhaps, as a novelty. Based purely on the experience of eating a steak of that age and texture, if I could afford it, I’d be inclined to have it more often. But, ever the skeptic, I would first need more answers than what I was provided. Note: Due to a large eating schedule, and it being mid-day, we did not imbibe. 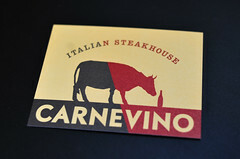 It seems tragic I know, as red meat – steak, especially – seems to desire a good glass of red wine. I wonder how wine would have enhanced, complemented, or – given its rather delicate flavor – overhelmed this meat. ~ by ulterior epicure on August 9, 2009. Like you I find the claims made incredible – especially when they are not prepared to back it up! Looks like a matter for the Trading Standards or the FDA. Maturing meat on the bone has long been practised by slaughterhauses and I have been shown whole sides hanging in the chiller for 21 days with a coat of fungus growing on it… this is simply wiped off and the joint is ready for trimming into cuts. Dry curing implies the use of salt as in prosciutto crudo to keep the bugs at bay – 3-5% is used and builds an effective barrier whilst the meat continues to loose weight and the point of dryness is reached at which the meat is less susceptible to bugs (so called ‘hurlde technique’ extensively used in most dry cured products). If they have really made a ‘breakthrough’ in maturing beef then they have something to shout about. They should TM it! @ Werner: This steak was not cured. It was dry-aged. That is very unusual. The ‘beefiness’ usually concentrates the longer it ages. Did they tell you it is dry-aged? If your friend is right about them sealing it, then I don’t see how that could be dry-aging. Maybe a cross between a dry and wet age but not a full fledged dry aged method. I agree with Werner though, this is something I have never heard of before. They should been shouting his from the heavens of how proud they are of the method, had it plastered on the menu, heck the server should have known a lot more about the process. I respect Chef Batali quite a bit but if they are not proud enough of their almost 1 year old aged steaks to inform you about how it came to be then something is fishy. Just saying. 1. The lack of concentrated “beefiness” may have been destroyed (or retarded) by UV radiation treatment. Of course, this is only speculation. But it would explain the surprisingly mild flavor of the meat. 2. I am not suggesting that the meat was hermetically sealed, as they do in the wet aging process (i.e. in a vacuum pack). Rather, my friend was speculating whether the areas of exposed meat had been “sealed” with a coat of rendered fat. I would still consider such a steak to be dry-aged, as it is not sealed in an air-tight container. I see your point but alas I would have to try it to experience what you had in order to have a valid point. My view on the method is that it has characteristics of both dry and wet aging, growing surface mold like a dry age but retaining a majority of it’s weight (I mean usually dry aging will see 1/3 loss in 1 month this lost that in close to a year) like a wet age. The point of aging to to concentrate flavors but rather they turned it into something different. Whatever they did is unique and I wouldn’t mind trying it. @ Chris: No, it is not wet-aged at all. That I’m fairly certain of. Otherwise, they’d be lying about the 11-month dry-aging. I believe them that this steak was butchered and began the dry-aging process 11 months ago. I just think there are some essential pieces to the story missing. I know all too well the texture and flavor of wet-aged steak. This certainly was not wet-aged. Excellent write-up. I’ve been trying to find out more about dry-aged beef, especially since it’s quite rare in Singapore. I am curious about the aroma because I’ve recently had one that had a strong aroma of blue cheese, not unlike the “Gorgonzola” you mentioned, so I am curious to know if that’s par for the course. I know David Burke has dry-aged steaks for extended periods with little mold growth by aging them in a room composed of Himalayan salt blocks. He did a presentation on it it at the 2nd Star Chefs ICC. I don’t think he went as far as 8 or 11 months, though. Why grass feed the cattle and then finish it with grain? This should be the other way around or (preferably) completely grass fed. This “grain and corn fed beef” is such marketing garbage. I would take grass fed Piedmontese beef over corn fed any day.